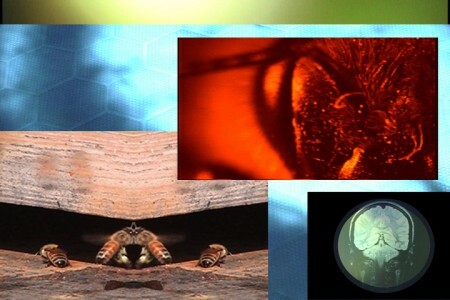 Concerns in life of the Apis mellifera are focused toward intersections between the sublimation of desire in physical labor and artistic production, mythology, the politics of representation of the feminine, and technologies of sight and imaging. Language in a beehive is constant, occupying a social interstice through exchange of food, pheromones, and vital information. The workers regularly communicate with one another in passing to spread news of the health of the hive, and display the distinguished bee-dance that charts a plentiful food source. The hive exemplifies a possible utopian view of social space, labor and subsequent division. Social organization and communication within the beehive interests not only those in the fields of entomology, but sociology and computer sciences as well. A non-hierarchical division of labor marks the matrix of the hive; all bees work toward material production of wax, honey, propolis, and brood. Hive labor requires undertaking of age-appropriate roles. A newly hatched bee begins work within the few first hours of her life by cleaning brood cells. She then continues to attend to the queen, feed her siblings, ventilate the hive, build honeycomb, pack pollen, guard the entrance, and forage for pollen and water. Bee language and production can be interpreted through the ancient Greek mythology understanding of the quest for divine perfection.